Assume an invoice of £6,000 for services (excluding VAT) issued by Joe Bloggs of ABC Ltd and that the payment falls within the new rules. 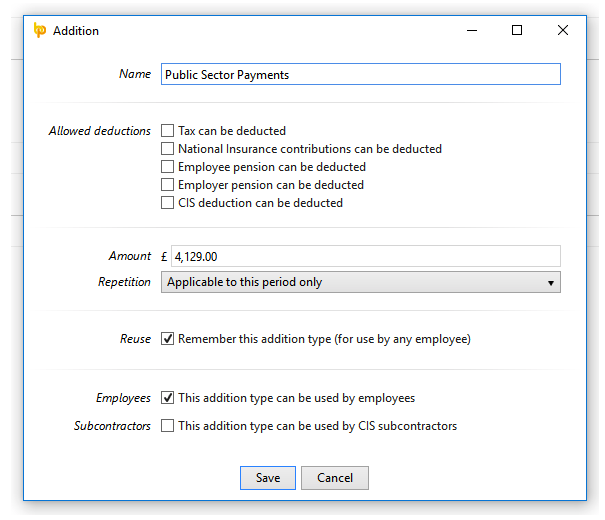 Using the example deductions in HMRC's article, as the public sector client has already deducted tax (£1,458) and NIC (£413), you receive £4,129 (excluding VAT). If you are paying yourself this £4,129 from your company, you will have no further PAYE or NIC liability on it, so, in your payroll system, you should mark the gross payment (£4,129) as not being liable to tax or NIC. In BrightPay, simply set up a new addition type as per the following screen. Ensure that tax, NIC etc. are all unticked. When the payroll is finalised, the non-taxable pay will appear on the FPS. Pay Joe Bloggs through your payroll as if he were a normal employee. When entering Joe Bloggs to your payroll, use starter declaration C - secondary employment. This will put him on basic rate tax. You should also tick that the employee is on an irregular payment pattern. The payment frequency that you select for Joe Bloggs should match their contract as closely as possible e.g. if he is being paid for a month's work and you put him through the weekly payroll run, this will adversely impact on your NIC figures. It may be useful to set up a department named “Personal Services Company” and assign Joe Bloggs to that department. This will enable specific reports for this category of employee. When the contract ends, P45 Joe Bloggs as you would a normal employee. The public sector client should treat Joe Bloggs as if he were a normal employee for AE purposes, if he falls within the definition of a personal services worker as per TPR's guidance (HMRC's guidance on this is contradictory - they state that Joe Bloggs should not be considered for auto-enrolment in all cases). If the contract is a one off, then postponement would be appropriate. If Joe Bloggs is genuinely self-employed and does not come within the scope of a personal services worker, then simply mark as exempt when BrightPay flags him for enrolment. In the payroll of ABC Ltd, if Joe Bloggs is not deemed as a worker in the public sector company, he should be enrolled by ABC. However, in the majority of cases ABC Ltd will be a single director company, so is not deemed an employer for AE purposes. This article does not cover the treatment of VAT. Please note that the definition of public sector client, for the purposes of these rules, is quite broad and includes those bodies listed in the Freedom of Information Act 2000. Click here for list. e.g. a GP surgery may fall under the new rules although it is difficult to imagine Joe Bloggs in the above example not being genuinely self-employed in this case (unless, for example, Joe Bloggs was a self-employed locum who only provides his services to the one GP surgery). It is also worth noting that the cost for the public sector client will have increased as a result of the employer NIC liability. This may lead to the re-negotiation of contracts in the majority of cases.